Would you like a reasonably-priced German branch office? Would you like to offer your customers a German address? Would you like to make it easier for your customers to get in touch by calling a German telephone number? We can offer you an attractive location in Germany for your business activities in the “Three Country Triangle” between Germany, Switzerland and France. You can use this service as a contact address for all your mail, telephone calls and faxes. Would you like to set up a German branch without having to pay for a whole new office? You can set up your own branch office in our facilities. 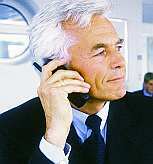 International companies that offer customers a German contact address use this service. Their customers save on high international post and telephone costs. Companies, especially ones involved in projects, can thus offer their customers a permanent address as well as a telephone number that always stays the same.